Extra fine. Source of iodine. Why Iodised Salt? Iodine is an essential and important micro-nutrient as it contributes to normal growth of children, cognitive function, production of thyroid hormones, thyroid function and energy-yielding metabolism. Why Cerebos? 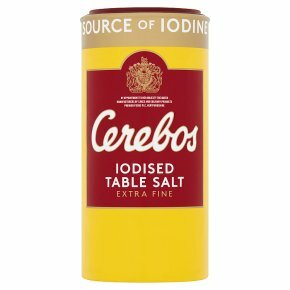 Cerebos Iodised Table Salt contains Potassium Iodate to provide a source of Iodine. A 1.5g portion provides at least 20% of the daily Reference Intake of Iodine.